Beth Ruyak’s documentary on Lauren “The Not-Dying girl” has been invited to show at the Sacramento International Film Festival. Lauren’s documentary will show during the Nor-Cal All Stars segment #3. It will be from 4:00pm to 6:00 pm on Saturday, May 4, 2019. The Not-Dying Girl will show, as well as two other short films, during the time spot. We’re so excited to be invited to this festival so more people can experience our film! The film will be shown at the Delta King in Old Sacramento. The ship’s theater seats 110, so if you’re interested in attending, don’t wait to purchase your tickets. Tickets for our segment are $12.00 each. We hope to see you there! As we continue to get the message out of the need for more fundraising for childhood cancers, we are hosting our annual St. Baldrick’s Shave Event in Elk Grove. It will be held Thursday, March 14, 2019 at BJ’s Restaurant and Brewhouse on Laguna Blvd. in Elk Grove, CA. Once again, Bell Brothers Heating and Air has partnered with us to bring this event to Elk Grove. We will have event T-Shirts, raffle prizes and silent auctions from 11:00am to 7:30pm. If you come to BJ’s for lunch or dinner on March 14th, BJ’s will donate 20% of the cost of your meal to St. Baldrick’s when you present a donation flyer. A copy of the flyer is attached so you can save it to your phone to show to your server. This offer is only good at the Elk Grove location, so when you come for a delicious meal, be sure to stop by our event set-up and check out our wonderful prizes available for raffle! Of course, there will be shaving! Amazing people are signing up to be shaved that day in order to raise funds for childhood cancer research. The shaving will take place from 4:00pm to 7:30pm. Please stop by to watch these incredible people laugh and have fun being shaved, all for a great cause! During the shaving, we will have Dinger from the RiverCats and a DJ to keep everyone rocking to the beat. People can sign up to be shavees, or donate directly to the event at https://www.stbaldricks.org/events/mypage/11251/2019. We hope that this will be our most successful event ever and would love to see readers of The Not-Dying Girl there! It’s been very difficult to go through the details of Lauren’s initial cancer diagnosis and her struggles throughout her treatments, but those were mixed with heartwarming details of how Lauren touched others and how others touched her. It also brought to the forefront the depth of our loss, missing Lauren every day that passes. However, this was a project that would have made Lauren so proud! She wanted to raise awareness of childhood cancer, not for her own benefit, but for the children who were yet to be diagnosed. We’re hoping this will help in some way to raise awareness, which can lead to increased funding for research to find better treatments and cures for children across the US and the world. When you click the link you’ll see Lauren’s smiling face. Scroll below to “Featured Project” and click on “About the film” and it will take you to where you can watch the trailer, link to this blog, and also see behind the scenes photos from filming the show. The show also airs on KVIE 6 on February 6 (7pm), February 8 (4:30pm) and February 10 (6:30pm). We’re all so thankful that Beth Ruyak felt a special connection to Lauren and wanted to spread her message to others. She took the utmost care in writing the outline and editing to tell her story the way I believe Lauren would have wanted it. The documentary is by Ruyak Media with Dos Eckes Productions and was co-written and co-produced by Beth Ruyak, Jim Eckes, and Suzanne Eckes-Wahl. Beth interviewed Dr. Wayne Jolly, Lauren’s oncologist, who took such amazing care of her through both of her battles. She also interviewed Mom Deanne, Dad John, and Brother Mark. Of course, Egor, Lauren’s “husband”, and DeAngela, Lauren’s bestie, were also interviewed. The story centers around Lauren’s fight, but also on her amazing bucket list wedding. DeAngela is the person who asked Egor to marry Lauren, and away we went, planning a wedding in just three weeks! We know Lauren would be proud of this project. The final interviews were done in Hawaii, where Egor was stationed with the Navy. The interviews took place on July 6, 2018, exactly five years after the dream bucket list wedding. Lauren gave us a sign of her approval by creating a rainbow in the sky the minute the last interview was complete. It was truly beautiful. We hope people are able to come to the Crest Theater to share in the experience. There are also the three air dates on KVIE for those who can’t attend, or those who just want to watch it again. We thank everyone who made this happen and all those who read her blog and kept her motivated to keep writing. Lauren lives on through her blog and all of us. 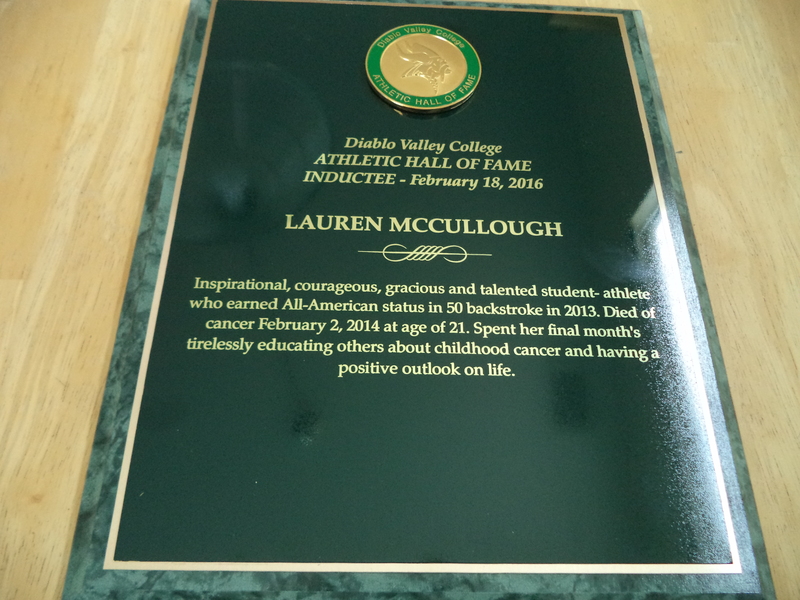 Lauren was honored by her college, Diablo Valley College in Pleasant Hill, CA, by being inducted into the Athletic Hall of Fame on February 18, 2016. The MC of the event was Steve Ward, head coach of the Men’s Baseball Team. 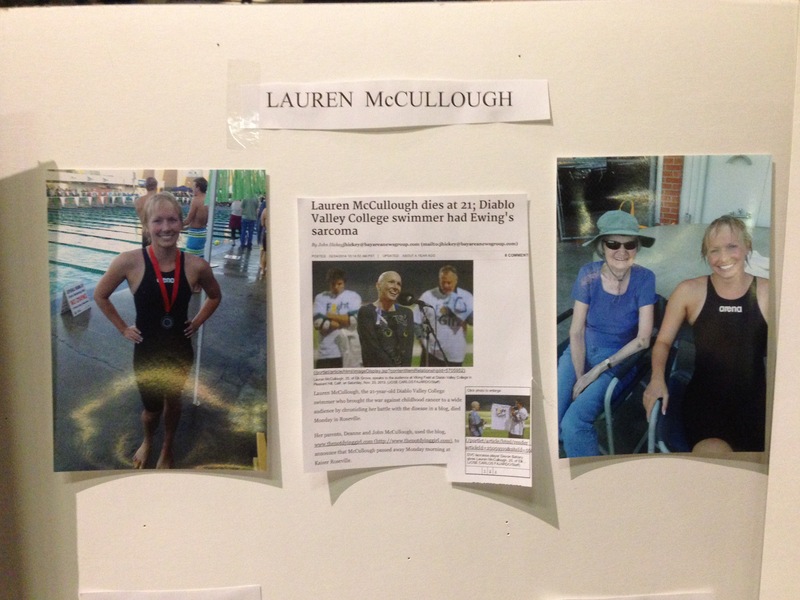 Many of Lauren’s family, co-op family, and friends were in attendance to show support for Lauren. Beth Ruyak, who gave Lauren an opportunity to get her message out during two of her Insight radio broadcasts at Capital Public Radio, was in attendance also. She was at the Sochi Winter Olympics when Lauren’s Celebration of Life was held, so she felt compelled to be at the ceremony to show her support of Lauren. You could feel the love in the room. “I am not sure that our HOF has any members as inspirational, courageous, gracious and humble as Lauren. 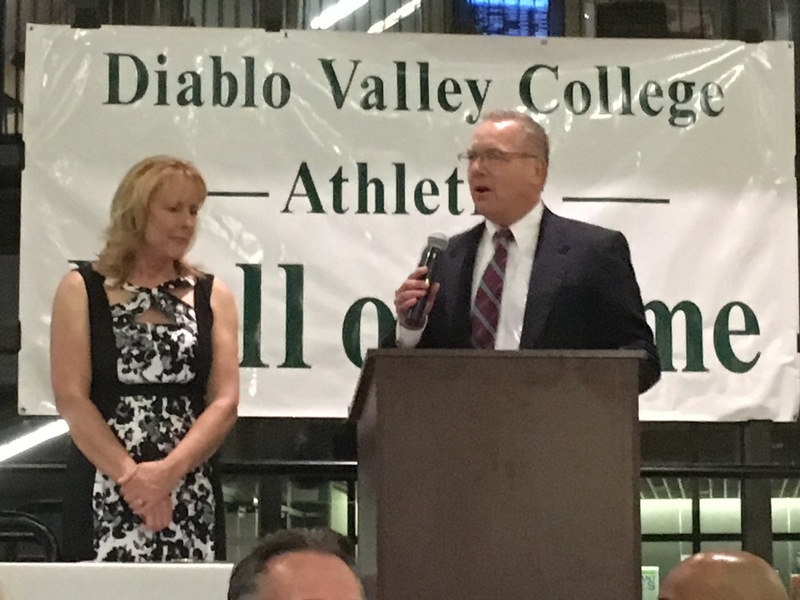 She attended the very first DVC Hall of Fame induction in 2006 as an 8th grader with her dad, John, who was an All-American swimmer on the 1973 State Champion swim team. Attending high school in Elk Grove, she earned varsity letters in four different sports. Then… just after she graduated she was diagnosed with an extremely rare cancer, Ewing Sarcoma, in one of her quadriceps. After nine months of non-stop chemo she was told her cancer was in remission. She enrolled at DVC in the Fall of 2012 and in the Spring 2013 term joined the DVC swim team. She finished 2nd in the 50 Back and 3rd in the 100 Back at the Big 8 Conference Championships. Her times were good enough to qualify in three events at the State Championship Meet the following week in L.A. On the first day she swam the 50 Free, but complained after the race that her side hurt and that she could hardly breathe. She was in the emergency room the next day and had fluid on her lungs, which kept her out the remainder of the State meet. Soon after, Lauren learned her cancer had returned. She still attended the end of the season swimming awards dinner and found out her 50 Back time had earned All-American status. In her last nine months she started a blog called, “Thenotdyinggirl” and her story was covered extensively by Sacramento area media. She gave anti-bullying rallies, got married, tirelessly spread the word about pediatric cancers, and was the honorary captain of the DVC Lacrosse team, who in November of 2013 held an American Cancer Benefit in her honor…In life, according to her father, she exhibited strength, humility, and a positive attitude right up until she died February 2, 2014 at the age of 21. Lauren’s mom then spoke about her achievements in high school swim, her positive outlook during her cancer treatment, and how her spot on the DVC swim team remaining open for her until she was able to join the team kept her motivated during her year of chemo and many hospitalizations. The coaches of the swim team treated her like she was a competitor, and not an “honorary” member of the team. That pushed Lauren to achieve so much during that season. She came incredibly close to achieving her pre-cancer personal best swim times. Like every girl, Lauren looked up to her dad. 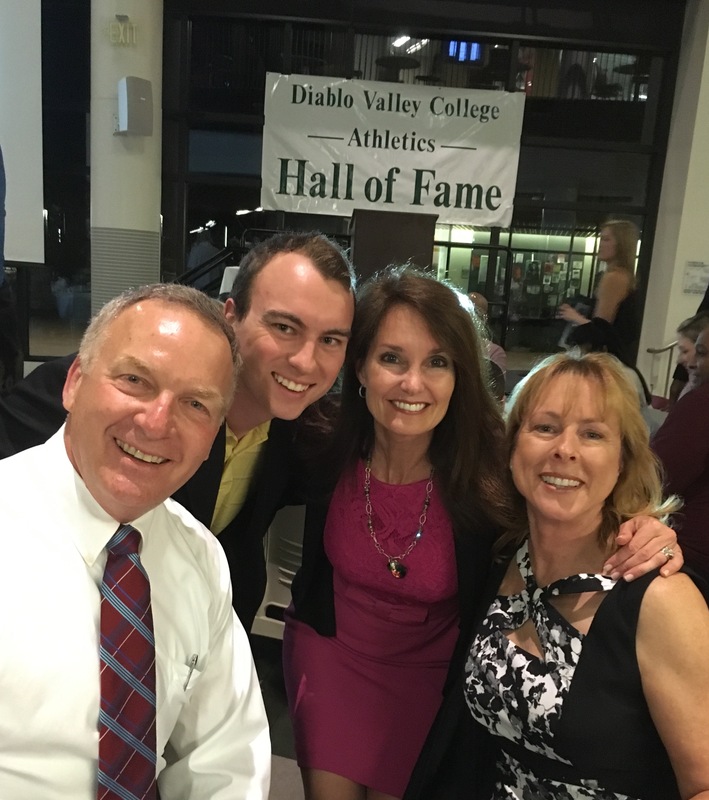 Lauren became an All-American swimmer, just like dad; swam at the State Championship Swim Meet, just like dad; and was now in the DVC Athletic Hall of Fame, just like dad. Lauren’s dad then spoke about how DVC has been so supportive of Lauren, both during her recurrence of cancer and after she has passed away. He thanked the school for supporting her and continuing to keep her message of childhood cancer awareness out in the public. The DVC Lacrosse team continues to hold American Cancer Society benefit games every November to raise money for cancer research and honor Lauren. He spoke of how he entrusted his two most precious things in life, his two children, to the swim team and Coach Rick Millington, and thanked Coach Millington for being there for both Lauren and Mark. This was an unforgettable event for all in attendance. 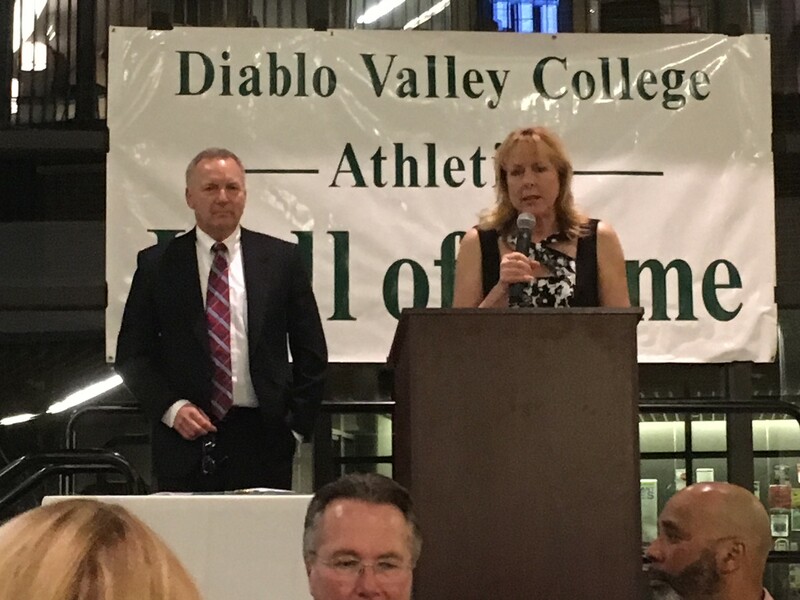 In addition to hearing Lauren’s story, it was inspirational to hear the stories of the other eight inductees into the DVC Athletic Hall of Fame. She is in great company. Upcoming event alert! 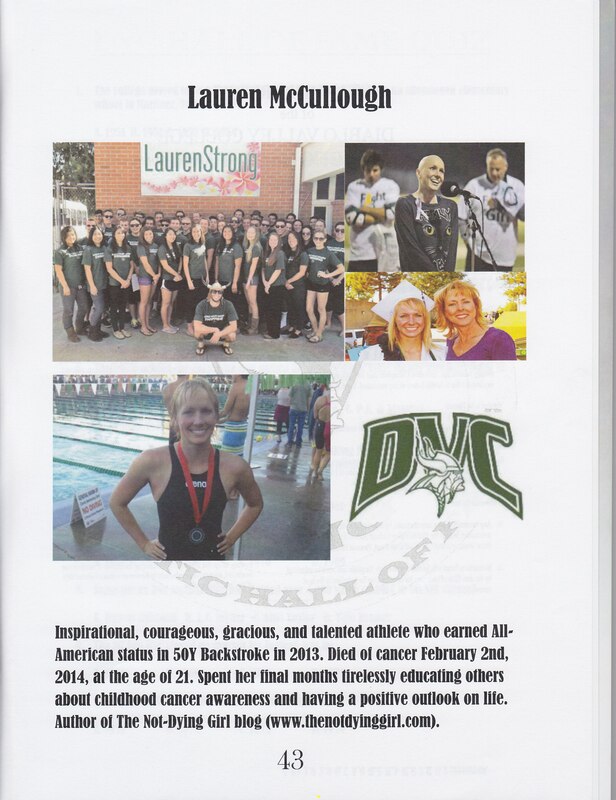 Diablo Valley College continues to support cancer awareness and keep Lauren in their hearts. On Friday, January 30th the men’s and women’s basketball teams with be having a fundraiser for the American Cancer Society and will be holding the event in honor of Lauren. The swim team will also be in attendance to show their continued support of Lauren and how much they meant to each other. The event is Coaches vs. Cancer, which is a nationwide collaboration between the American Cancer Society and the National Association of Basketball Coaches. There will be a pregame ball presentation with the swim team and coaches prior to the women’s game. Lauren’s dad and I will be saying a few words prior to each game. 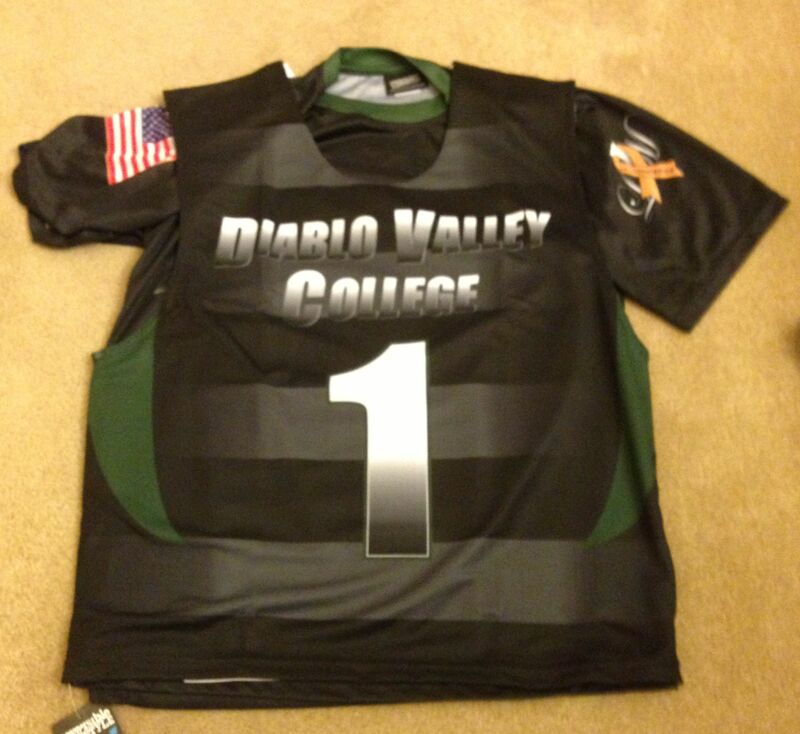 We continue to be amazed at the ongoing love and support from Diablo Valley College Athletics. The women’s game starts at 5:30 pm. and the men’s game starts at 7:30 pm. at DVC in Pleasant Hill. Please come out to Diablo Valley College in Pleasant Hill and support this wonderful event. All proceeds will go to the American Cancer Society. 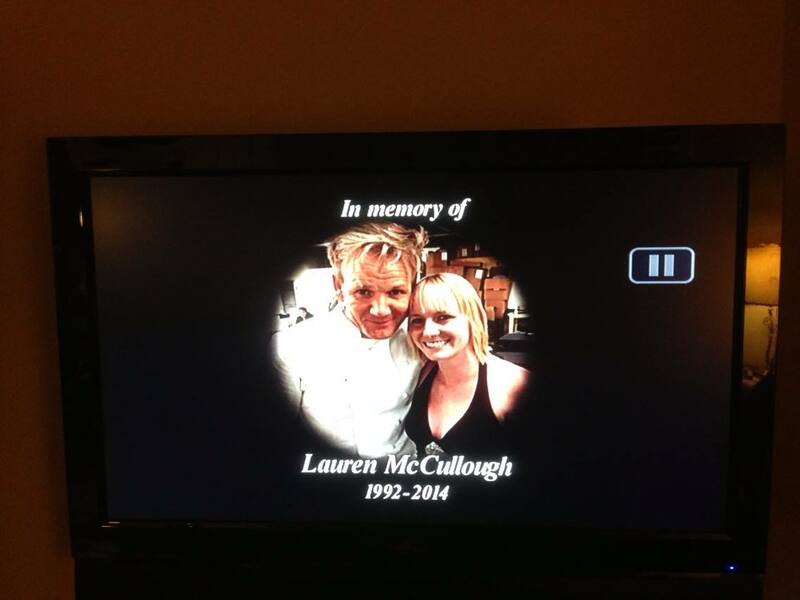 Hell’s Kitchen was an excellent show on the night Lauren was in attendance. To watch the show and see clips of Lauren enjoying her night was awesome! The clips come quickly, so watch for when we enter the dining room at the beginning of dinner service. Lauren enters first, followed closely by mom, then dad and the Dream Foundation representative, Dawn Reid.